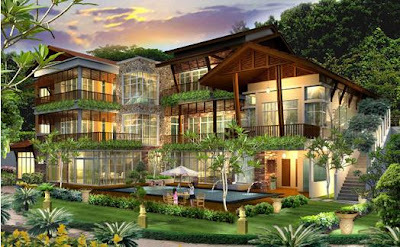 An Artist's Impression of Setia Eco Park, one of the property development of Sp Setia's. Petaling Jaya: SP Setia Bhd posted a net profit of RM42.68mil for the third quarter ended July 31, up 4.45% from the RM40.86mil in the previous corresponding period, mainly to strong sales recorded from its 5/95 home and commercial ownership campaign. The company told Bursa Malaysia yesterday in notes accompanying its financial results that the effects of the campaign were beginning to be reflected in the group’s financial performance which had helped reverse the negative profit trend in the first and second quarters. Revenue for the period under review rose 4.8% to RM317.05mil from RM302.4mil previously, while earnings per share were 4.2 sen compared with 4.02 sen.
For the nine-month period, its net profit fell 16.7% to RM114.37mil from RM137.38mil in the previous corresponding quarter, while its revenue declined 2.2% to RM887.46mil from RM907.57mil. “The group’s profit and revenue were mainly derived from its property development activities carried out in the Klang Valley, Johor Baru and Penang,” the company said. ING Insurance Bhd anticipates its total mortgage portfolio to grow this year, backed by its latest fixed-rate home loan that offers the lowest rate. The insurer has had strong demand since it started offering a fixed interest rate of 4.85 per cent with zero entry cost since January this year. Currently, the mortgage portfolio accounts for less than 10 per cent of ING's RM3 billion asset under management. Although it is a small portfolio, the mortgage business is a profitable one for ING, which is one of the few insurers in the country that offer home loans. It has started giving out the fixed interest rate loan since 1985. ING Insurance's latest programme comprises fixed rate packages for properties priced from RM100,000 to RM5 million. Speaking at a media briefing in Kuala Lumpur yesterday, chief investment officer Mark Wang said bank's interest rates could rise in the future and borrowers need to know their options. "We expect the Malaysian economy to regain growth next year, and when that happens there could be an upward movement in terms of interest rates and investors need to be aware now of other alternatives mortgage loans which will allow them to lock in their borrowing cost and without having to worry of any increasing rates in the future," he said. Chief operating officer Isold Heemstra said fixed interest rate home loan can offer more certainty and peace of mind. "The interest rate is fixed at a certain rate throughout the life of the loan, which means that you will know exactly how much is going out every month of your home loan repayment. "This stable interest rate is an ideal alternative for those who seek financial stability and have the desire to plan ahead," he added. PETALING JAYA: It may be time for property investors to consider managing their long-term investment with the stability of fixed-rate home loans, says ING Insurance Bhd chief investment officer Mark Wang. With the current economic downturn, many institutions, including ING Insurance, were offering highly competitive fixed rates for home loans, he said. “Fixed-rate mortgage can reduce uncertainty and lock in (one’s) borrowing cost. “ING Insurance is offering a fixed rate of 4.85% per annum on home loans locked in for 30 years, which is probably one of the most competitive rates for mortgages in the market today and our lowest fixed rate (on mortgages) in over two decades,” he said yesterday. Wang was speaking at a session on Smart Financing For Property Investment at a media luncheon talk hosted by ING Insurance. On the benefits of fixed-rate mortgages over floating rates, Wang said it was generally better for homeowners to stick to a fixed-rate mortgage. “But if an investor had the expertise and was managing a porfolio of properties, then perhaps a floating rate could be advantageous,” he said. He added that it was also important to take into consideration the floating rate when buying a property. Wang said with fixed-rate mortgages currently at an all-time low, it might be worthwhile for property investors or homeowners on high floating rates to refinance their properties at a lower fixed rate. On ING Insurance’s fixed-rate mortgage, he said it currently represented less that 10% of ING’s business. “We see our fixed-rate mortgage as a value-added offering to our existing clients with insurance coverage, but it is also now extended to the public,” he said. ING Insurance chief operating officer Isold Heemstra touched on the importance of structuring one’s financial needs according to the different stages of one’s life. “Only about 5% of the working population do their own financial planning. The rest are likely to seek advice from experts,” he said. 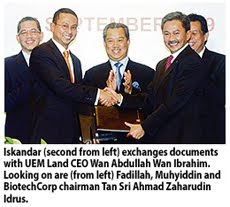 MALAYSIAN Biotechnology Corp Sdn Bhd (BiotechCorp) has teamed up with property developer UEM Land Holdings Bhd to jointly set up a biotechnology park in Nusajaya, Johor, with an initial investment of RM550 million. The two companies signed a joint-venture agreement yesterday to develop the biotech park dubbed "Bio-XCell" at the Southern Industrial and Logistics Clusters (SiLC) in Nusajaya. BiotechCorp will hold a 60 per cent stake in the joint venture company, while UEM Land will take the rest. Bio-XCell aims to create a dedicated biotech park with custom-built facilities catering to commercial development, research and development as well as production of industrial and pharmaceutical biotech products. The RM550 million will pay for the land, as well as primary and secondary infrastructure. "We will raise the money needed through a combination of internally generated funds and borrowings," BiotechCorp chief executive officer Datuk Iskandar Mizal told reporters after its signing ceremony in Kuala Lumpur. The event was graced by Deputy Prime Minister Tan Sri Muhyiddin Yassin and Deputy Science, Technology and Innovation Minister Fadillah Yusof. BiotechCorp has identified and started engagements with several targeted strategic international partners and collaborators to anchor Bio-XCell. The event did not only mark the start of the joint venture between BiotechCorp and UEM Land, but also saw Holista Biotech Sdn Bhd signed a collaboration agreement with University Sains Malaysia (USM) and University Technology Malaysia (UTM). Holista recently concluded its reverse takeover (RTO) of an Australian biotech company, Colltech Australia Ltd, which is listed on the Australian stock exchange. Colltech is in the development and commercialisation of ovine (sheep) collagen. The collaboration with USM is to conduct research on the development of "halal" collagen and collagen standardisation, expected to turn Malaysia into an important player in the global collagen market. Holista's tie-up with UTM, meanwhile, is in the launching of an anti-aging cream with "Kacip Fatima". The initiative will be a first in the world. JOHOR BARU: Senai Airport Terminal Services Sdn Bhd (SATS) has formed a new subsidiary, called Senai Hi-Tech Park Sdn Bhd (SHTP), to oversee the Senai Hi-Tech Park project. SATS deputy chief executive officer Shahrull Allam Shah Abdul Halim said the company has also appointed former Kulim Technology Park Corp Bhd chief executive officer Datuk Ahmad Shukri Tajuddin to helm the subsidiary. Shahrull said as CEO of SHTP, Ahmad would be responsible for the day-to-day operations of the park. “We believe that with his vast experience managing Kulim Hi-Tech Park, Ahmad will contribute immensely to Senai Hi-Tech Park,’’ he told StarBiz yesterday. Shahrull said SHTP would be calling for tenders for earthworks of the project before the end of the year, followed by infrastructure work. International Trade and Industry Minister Datuk Mustapa Mohamed said recently that the Federal Government had agreed in principle to part finance the infrastructure work for the Senai Hi-Tech Park. The Government would allocate RM300mil for the infrastructure work while the balance of RM215mil would be borne by the developer. Senai Hi-Tech Park will be the second high-tech park in Malaysia after Kulim Hi-Tech Park in Kedah. Shahrull said SHTP had recently started marketing the project to foreign investors in Germany and Singapore and would be going to the United States next month and Japan early next year. He added that the high-tech park aimed to attract investments in the avionics/aeronautics industry, information and communications technology industry including integrated circuit design and high-tech manufacturing, among others. Among the companies and investors targeted are those in the pharmaceuticals industry from Austria, Germany and Switzerland; oil and gas and solar energy sectors in the United States; and Japan’s motor vehicle sector. “It is a pre-requisite for companies operating in our park to have research and development (R&D) elements,” he said, adding that there would be a flagship building known as the knowledge centre where most of the R&D activities would be undertaken. Senai Hi-Tech Park, spanning 404.68ha, is located next to Senai International Airport and is one of the three components of the multi-billion ringgit Senai Aviation & Airport City project, the other two components being residential and commercial, in addition to an air cargo logistics centre occupying a 404.68ha site. “Our park will probably be the first integrated high-tech park in the world connected to the airport. Similar parks like the ones in Frankfurt and Dubai are located several kilometres away from the airport,’’ Shahrull said. SATS subsidiary Enigma Harmoni Sdn Bhd, which is linked to billionaire Tan Sri Syed Mokhtar Al-Bukhary, has received approval from the Kulai Municipal Council for the Senai Aviation & Airport City project. GEORGE TOWN: Penang will have 10 new three to five-star hotels which are expected to be built between 2010 and 2014 and the total investment is expected to be more than RM1 billion. Malaysian Association of Hotels (MAH), Penang chapter chairman Marco G Battistotti said on Sept 18 the new hotels would expand the rooms, in the three to four star hotel category, by 50% from the 9,000 now to 13,000 rooms in 2014. "Out of the 10 (new hotels), three of them will be completed in 16 weeks, another two hotels will be built next year and five more hotels will be built between 2011 and 2014. "At least five of them are hotels belong to national or international chains, some of which are already in Penang," Battistotti said at the launch of MAH Penang's website www.discoverpenang.com.my by Chief Minister Lim Guan Eng. Over the next 16 weeks, the three hotels which would open their doors are the Hard Rock Hotel (opens on Saturday) in Batu Ferringhi, Flamingo Hotel (the former Crown Prince hotel) in Tanjung Bungah and Eastin Hotel in Bayan Bay. As for the website, it is linked to over 40 MAH Penang members and also 45 Penang related websites. Tourists could book their rooms on online. "Since Penang wants to attract 10 million tourists in 2014, the additional 50% increase in rooms will be able to accommodate the increase in tourist arrivals, which was 6.3 million last year," he added. Battistotti said despite the global economic downturn, Penang's beach hotels recorded higher occupancy rate this year compared to 2008 while the city hotels saw a 2% to 3% drop. Lim said there were also investors who were building boutique hotels in the heritage enclave area which augured well for Penang's tourism efforts. "Even though they can only build hotels with the maximum five-storey height, they are still coming in to invest and this reflects the dynamism of the tourism industry in Penang," Lim said. To promote Penang as a brand, there was a need to ensure only quality and reliability was associated with the name "Penang". "We have the legal moral and moral responsibility to protect our brand name as it belongs to the people of Penang and as the custodian of the people, the state government has every right to protect the branding of Penang. "We are promoting Penang aggressively and in order to project our image internationally, we have to ensure that it is not misused by some people, who would spoil Penang's image. "This is why I have been emphasising that we need to control the use of the "Penang" label as there have been instances of some tourism related projects, which had failed and it reflects badly for the tourism industry," he added.